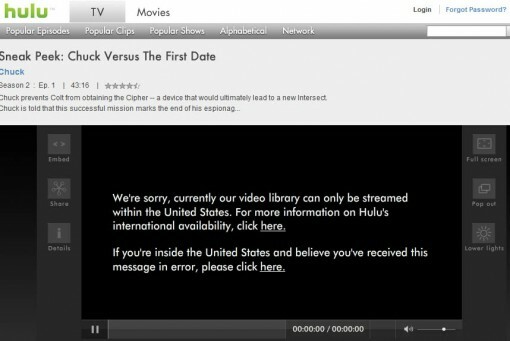 Hulu has some good video content but it is only available for US viewers. If you are outside US like me and want to enjoy Hulu shows there is an easier way. Gpass is a freeware that allows you to access Hulu or Pandora or any other site that is restricted outside the US. Gpass is a portable self executable app, download Gpass from here and open it. Now add or delete application shortcuts from Gpass to access content. By default it loads browser, mail, media player etc shortcuts. Click on the browser to open a restricted site in new window, enter the URL and you can get rid of the IP based filtering employed by sites like Hulu and Pandora. Gpass works like any other anonymous browsing by hiding your IP address to avoid IP based filtering. Gpass encrypts your data to protect from your boss or sys admins. Gpass works with Windows 2000, XP and Vista, it is portable so doesn’t need an installation, you can fire up from your USB stick. I checked myself the app, it is able to stream Hulu and Pandora continuously with out breaks. It doesn’t bombard you with NSFW ads like other proxy sites. This is a good trick, I was using proxies but none was fast enough to stream videos but it works fine, thanks for sharing.